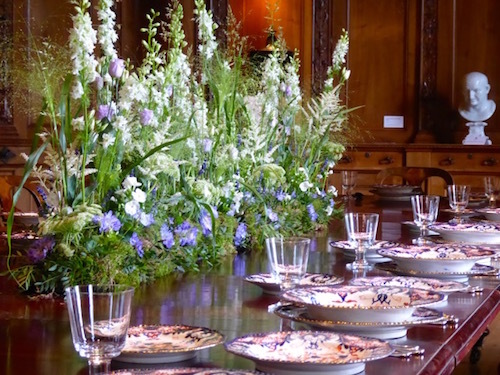 Happy Saturday…spotted this stunning flower arrangement during a behind the scenes tour at West Dean House. 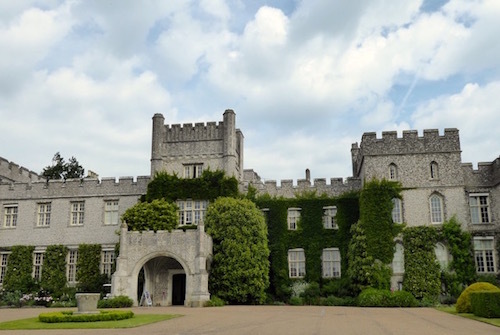 West Dean House and College, located near Chichester in West Sussex, were absolutely buzzing yesterday, with hundreds of people turning out for the popular Arts & Crafts Festival. The event, which runs today (June 3, 2017 ) and tomorrow, is a wonderful celebration of arts, crafts and West Dean’s creative history, bringing together more than 200 artists, makers, writers and performers. As well as tours of the impressive state rooms and demonstrations, there will be a chance to try your hand at a variety of taster workshops. The historic house, which was formerly the home of the poet and Surrealist patron, Edward James, is fascinating. My tour included a glimpse of this eye-catching spiral staircase, with its amazing Footprint Carpet and Ring wallpaper. The striking carpet was created by James, in the early 1930s, and made in homage to his ballet dancer wife, Tilly Losch. 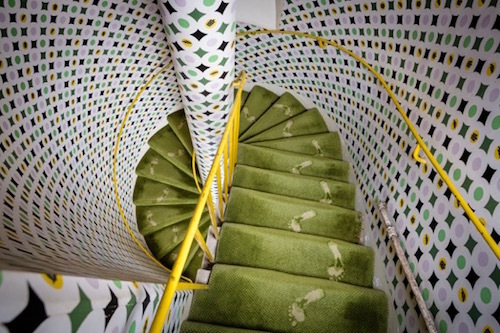 The vibrant green shade of the tortoise print wallpaper was designed to match the personalised carpet, depicting Losch’s footprints. 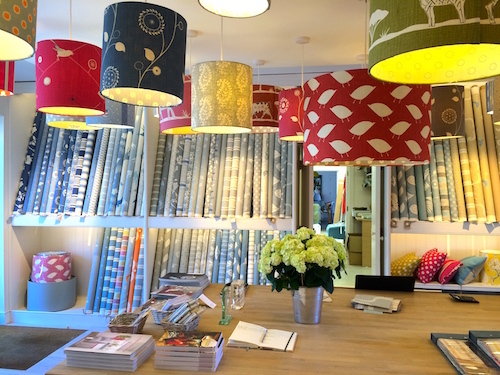 If you fancy finding out more about the secrets of West Dean and its intriguing arts heritage, discovering a new skill or buying a unique piece from some of the country’s top designers and makers, I’d definitely recommend a visit to West Dean. It’s in a glorious setting and will be looking dazzling in the sunshine this weekend. Staircase image below, courtesy of Christoper Ison. 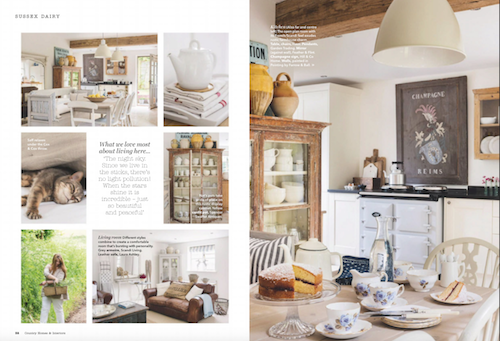 A little glimpse inside the feel-good, summery issue of Country Homes & Interiors. 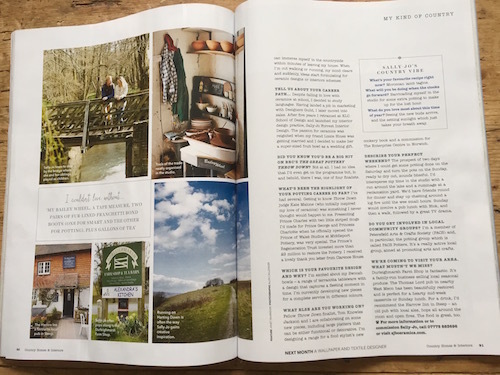 I just loved writing this article about the fabulous Nat Woods and her husband Doug, who have worked tirelessly to turn a dated barn into an absolutely gorgeous rural home. At one stage, Nat feared she’d lost the house of her dreams. Thankfully, though, all turned out well in the end, and this hard-working pair have created a beautiful home that they adore. Nat’s passion for interiors, sourcing antiques and finding beautiful, quirky pieces, plus Doug’s DIY skills, have combined to create a delightful, relaxed cottage that’s just bursting with personality and charm. If you’re on Instagram, you’ll find Nat’s at @laid_back_farmhouse – oh, and I’m @janetmcmeekinwriter, if you’d like to pop over to see what else I’ve been up to lately. 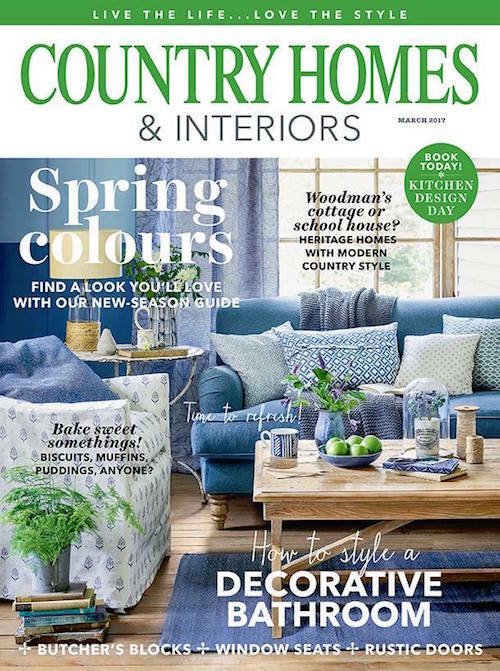 Huge thanks to 25 Beautiful Homes for publishing not just one, but two of my interiors features, in their sparkling May issue. Here’s a little glimpse of one of the articles about the fantastic restoration of a dated farmhouse with amazing links to the past. 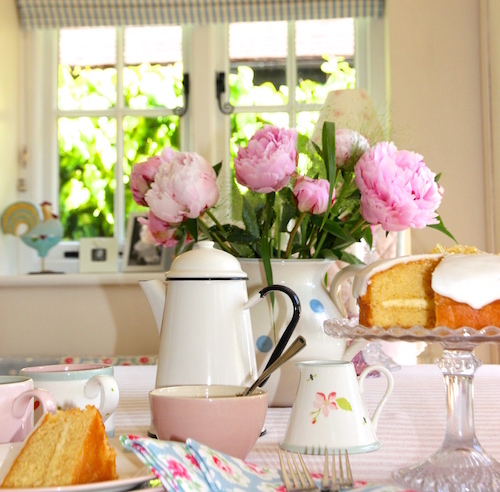 Delightful owner Sarah Croake worked with The Interiors Lady, Helen Orrock, to create, what’s now, a dreamy family home. A few months ago, I posted a ‘behind the scenes’ photo of a striking cloakroom in an amazing Georgian vicarage. 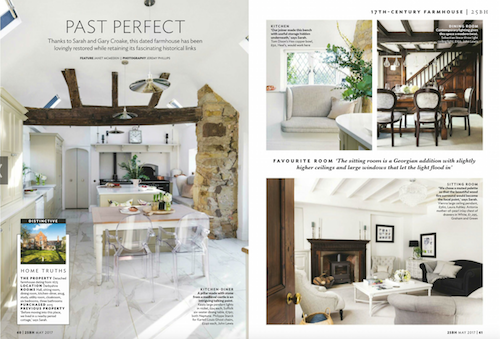 Well, the feature about lovely Gemma May-Brown’s fantastic Oxfordshire home is out now, in the current issue of 25 Beautiful Homes. Gemma, who runs Kingdom Projects, is an incredibly talented project manager who knows more than a thing or two about creating stunning homes, as you can see from these superb shots taken by one of my photographer colleagues, Richard Gadsby. 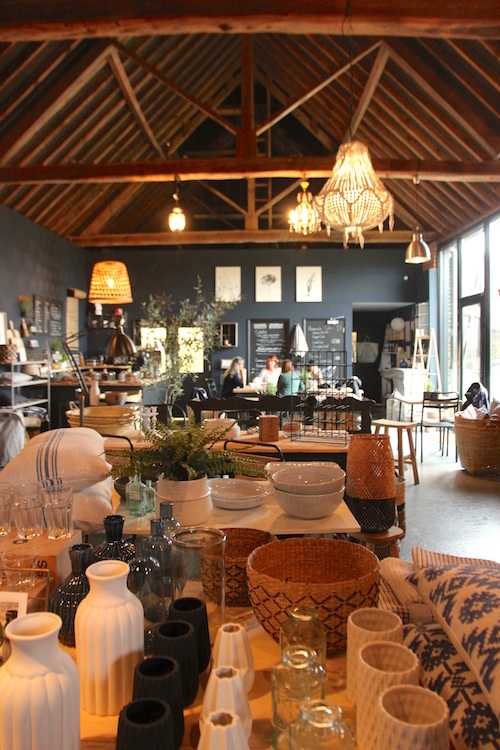 Fantastic to catch up with the very talented potter and interior designer, Sally-Jo Bond, at the weekend. 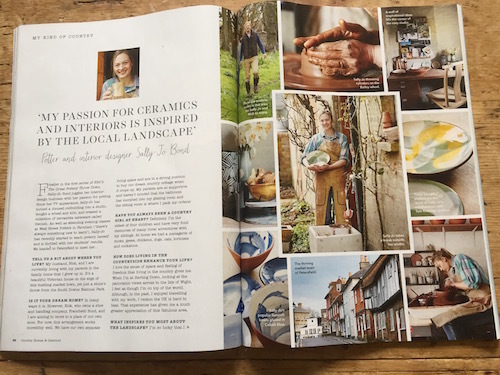 I thoroughly enjoyed interviewing Sally, the vivacious finalist in BBC’s Great Pottery Throw Down series, for my four-page feature in this month’s Country Homes & Interiors. Sally, who’s recently given birth to a gorgeous little baby boy, has been receiving great feedback about her My Kind of Country feature, and tells me she’s already had several enquiries about her work. Phew…I really can’t believe where this month has gone! 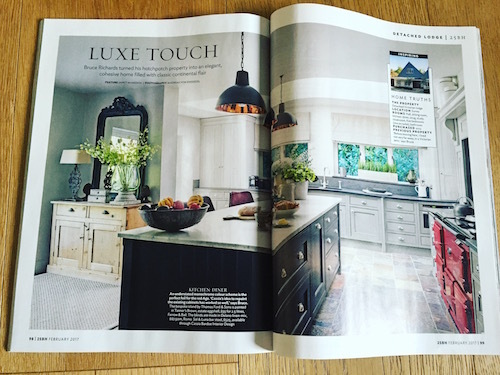 Thanks to everyone who has contacted me with such incredibly kind feedback about my article in 25 Beautiful Homes and both my features in Good Homes. The phone has been red hot over the last few weeks, and my fingers have been flying as I’ve been writing new features to hit magazine deadlines. 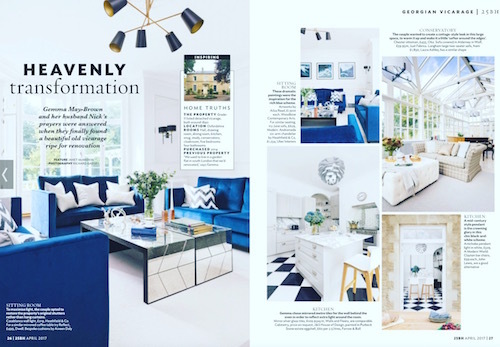 It’s just fantastic to be in contact with eager homeowners who are so keen to have their gorgeous homes featured in the magazines I write for. Hoping that your new year is off to a flying start too. If you’d like your own home featured in one of the magazines I write for, drop a line to mail@janetmcmeekin.co.uk or give me a call on 01243 792379. Happy New Year. Hope you’ve had a wonderful festive break and that 2017 is a fabulous one for you and yours. It’s already shaping up to be a wonderful year here, with plenty of features about beautiful homes and interesting businesses in the pipeline. Just before I get down to writing the next feature, here’s a quick look back at a few behind-the-scenes snaps and highlights of 2016. 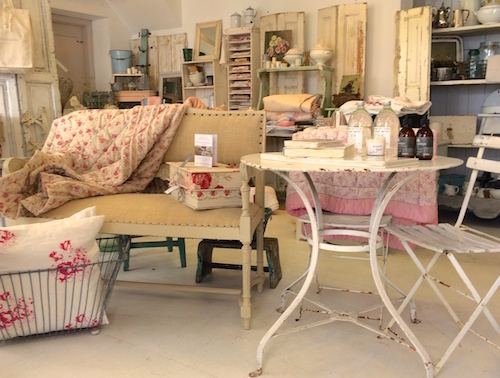 The image above was taken during the summer when I visited The Country Brocante Store in Midhurst with my sister – a memorable, fun-filled trip. If you’d like your own home featured in one of the magazines I write for this year, drop a line to mail@janetmcmeekin.co.uk or give me a call on 01243 792379. Happy Friday! Quick behind-the-scenes glimpse of a fantastic festive photoshoot at a ‘winter wonderland’ home. 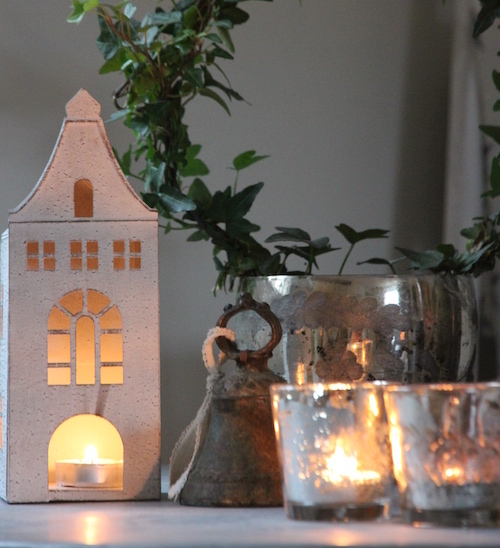 Amazing attention to detail…every room looked stunning, particularly when we lit the twinkly tealights. If you love decorating for Christmas, and would like your own home to be featured in one of the many national magazines I write for, drop me a line at mail@janetmcmeekin.co.uk or call 01243 792379. One of the best parts of my job has to be pulling up outside a wonderful home and seeing that it’s actually even more stunning in reality than I’d imagined. This was certainly the case when I arrived at this historic gem of a property in Wiltshire. The shots that I had seen were super but, when the wrought iron gates went back, and the car crunched down the gravel drive, I definitely had a tingle of anticipation as to what lay inside…and I certainly wasn’t disappointed. I’m thoroughly enjoying writing the feature about this beautifully-renovated home that oozes both character and style, and I can’t wait to show you more when it’s published in 2017. 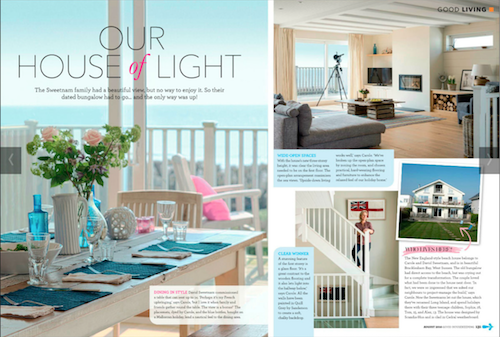 If you’d love your own home to be featured in one of the many national magazines I write for, drop me a line at mail@janetmcmeekin.co.uk or call 01243 792379. I’m also currently looking for stylish bathroom makeovers. If your bathroom is a little bit different, and you happen to have a ‘before’ shot, do get in contact – it would be great to hear from you. Just love the way this creative couple have let their imaginations run wild – in the smallest room of the house. If ever there was a space in your home where you can inject a bit of wow factor, the cloakroom (aka downstairs loo!) 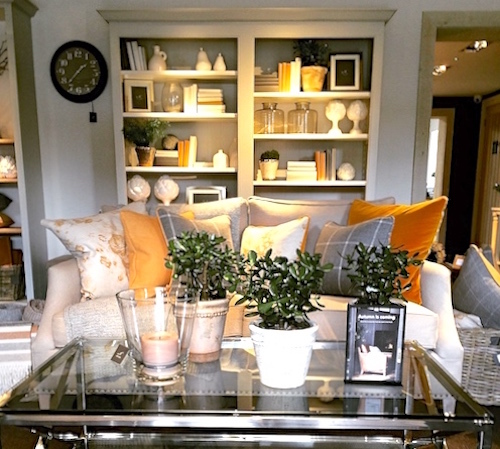 is undoubtedly a room that you can definitely get away with going a little (or a lot) OTT. I snapped this ‘behind the scenes’ shot during a fabulous shoot at a wonderful Georgian home in Oxfordshire – more to come on that soon. 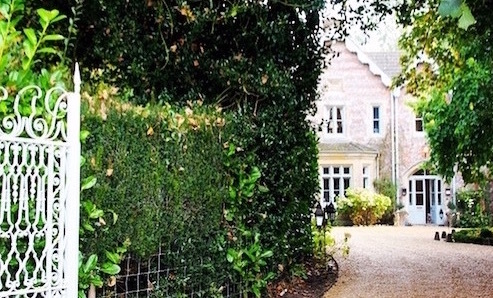 The hard-working pair have totally transformed the dowdy property into a truly elegant home. 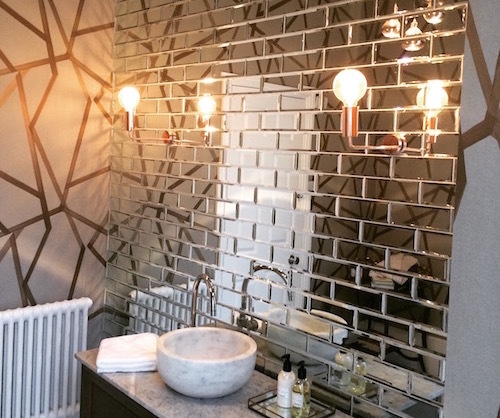 It’s full of surprise touches, such as this amazing room with mirrored metro wall tiles from Walls and Floors, geometric wallpaper from Harlequin, and funky lights from Heal’s and Next. Oh, and I’m also currently looking for stylish, wow factor bathroom makeovers. If yours oozes style, something a little bit different, and you happen to have a ‘before’ shot, do get in contact – it would be great to hear from you.